The fascinating metaphysical content in the writing of Sarah Gerkensmeyer benefits from her style, which is spare, uncluttered with the excess to which metafiction sometimes gives license. This anchor both opposes and accentuates the sense of disorientation that Gerksmeyer’s prose creates as it departs from real life as we know it, and travels ever deeper into a phantasmagoric, unmapped wilderness that continues to be convincing all the way through to the last sentence. It produces a powerful pull to emotion, and an urgent impulse to re-examine our reality as we know it, to look at life again and see if, maybe, we’ve missed something. This is the possibility of transformation that all the best writing offers. This is so close to a program that might exist that it’s impossible not to begin believing in the story immediately. The rescuers are trained to call to each other’s souls, and to sit with the fallen person, looking into their eyes until together they can finally both get up together. It is a touching story that speaks of loss and hope simultaneously. She grips onto my arms and I can feel all the strength in the world in her soft, papery hands alone. I know we’ll be just fine. We are both patient, staring at each other and waiting for our strength to build up enough. It’s hard to describe how it works. I can’t describe the feeling that takes over when your equilibrium first starts to go. It’s not about the technical stuff: the workings of the inner ear and balance and the weight of the body versus gravity. It’s about all of your memories and experiences and moments—the stretch of your entire life—becoming suddenly off-kilter, wavering precariously over the edge of nothing but blackness. I get sucked into staring into the horrible shine of that pond’s surface so easily. What if I fell in? There’s a belief, tucked deep inside, that she could save me. That even though it would be impossible, she would find a way. It would be Nora. Not my dead husband or my dead father... it would be Nora. Life is sweet, harrowing, and sometimes horrifying. Sometimes there is loss, but sometimes there is rescue. There is a tender, tenuous line between the two, and Gerkensmeyer walks it brilliantly in What You are Now Enjoying. 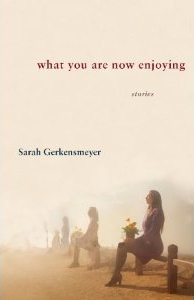 The title story of Sarah Gerkensmeyer’s What You Are Now Enjoying appeared in issue 41 of Hayden’s Ferry Review.